While you may have been tucking into the turkey or getting stuck into Christmas party games on Christmas Day, lots of people were using one of the many services we offer. We've pulled together some facts and figures about the services you might have expected people to be using, and a few pieces of content you might not have realised people would be looking it. They highlight the wide range of services and information users need, and the important role that digital plays in providing public services around the clock. 2,508 users took a practice car theory test, with most users taking a test between 6pm and 7pm. 52% of practice tests were taken on a mobile, with another 14% using a tablet. Just over a third (34%) used a desktop. There were 1,667 theory test appointments booked during Christmas Day. Most people went to GOV.UK to use the service between 8pm and 9pm. Most users (61%) accessed the service on a mobile phone, with 9% using a tablet and 30% using a desktop. 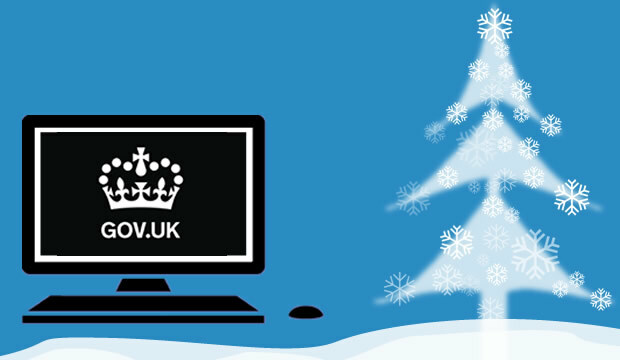 194 users rebooked their theory test appointments booked during Christmas Day, and 57 users cancelled their test. Most people went to GOV.UK to use the service between 10pm and 11pm. Most users (62%) accessed the service on a mobile phone, with 7% using a tablet and 31% using a desktop. 723 driving test appointments were booked during Christmas Day. Most people went to GOV.UK to use the service between 8pm and 9pm. Most users (59%) accessed the service on a mobile phone, with 9% using a tablet and 32% using a desktop. 714 users rebooked their driving test appointment during Christmas Day, and 57 users cancelled their test. Most people went to GOV.UK to use the service between 8pm and 9pm. Most users (69%) accessed the service on a mobile phone, with 5% using a tablet and 26% using a desktop. There were 31 driving test appointments booked by instructors for their pupils on Christmas Day. They also rebooked 20 appointments, and cancelled 15 appointments. 37% of users accessed the service on a desktop, with another 37% on a mobile. The remaining 26% used a tablet. 7,567 users checked the MOT status of a vehicle, with most people (549) checking between 8pm and 9pm. 68% of users checked on a mobile phone, with a further 11% on a tablet. Just 21% used a desktop. 10,213 users checked the MOT history of a vehicle, with most people (823) checking between 8pm and 9pm. 62% of users checked on a mobile phone, with a further 12% on a table, with 26% using a desktop. 481 users checked the rules on on practising driving with family or friends, while 353 checked the rules on displaying L plates and P plates. 138 users checked the maximum MOT test fees, while another 78 checked if their vehicle was exempt from the MOT. 79 users were thinking about a change of career, and checked whether or not they could become a driving instructor. 46 users checked our guidance on taking MOT tester annual training and assessments. Our videos on YouTube were watched 1,306 times. The most popular was our video explaining how the hazard perception test works, which was watched 206 times. Follow DVSA digital on Twitter and don't forget to sign up for email alerts.